Does this sound like something you’ve said at the beginning of the year? This class is much more challenging than my last group. I feel like my students are in Boot Camp. Click HERE to watch this if you feel like you herd cats. I can’t tell you how many times I have told my husband at the beginning of the year that this class is so much more challenging than my previous class. That was when he reminded me that I say this every year. I need that reminder that it takes awhile for my class to learn my procedures. Until they learn the way I run my class, it feels like I am herding cats. Did you watch the video? If so, then you too can relate! Before you can effectively teach procedures, your students need to listen and attend to what you are saying. 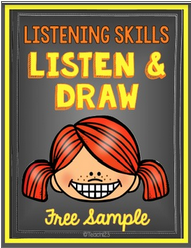 I like to do simple listening activities during the beginning of the year to work on listening skills. Simple Simon is a fun sponge activity that also improves listening skills. If you can hear me, put one finger on your knee. If you can hear me, tap your shoulder with your left hand. If you can hear me, hop up and down one time. This is a fun game that is challenging. It is an audio concentration game. Try it out and see how you do! I had to laugh as I recognize that talk with my husband too. This year though I did have the most distracted listening that I have had. I really appreciate this port and want them to try the audio game and listening activities. Thanks so much for putting it all together!